The color and brightness of your teeth can be naturally affected by years of exposure to food and beverages, or to substances like alcohol and tobacco. Some stains can develop for other reasons, such as inadequate hygiene or certain medical conditions. In many cases, you can erase stains and brighten your teeth with professional whitening treatment. For your convenience, we offer two highly effective teeth whitening methods that you can receive in our office or perform at home. Teeth whitening involves erasing the stains on the surfaces of your teeth and oxidizing the underlying tooth structure using a potent but safe bleaching gel. Our most popular teeth whitening option is a kit that you can take home containing a supply of professional bleaching gel, and a custom-designed set of trays that fit snugly over your teeth. By using the trays to apply the gel for a couple of hours a day, you can brighten your smile considerably from the comfort of your own home in as little as 10 to 14 days. Sometimes, you might need a quick touchup to brighten your smile in a hurry. 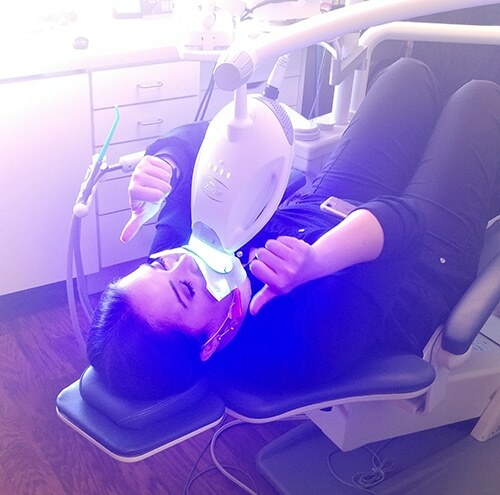 If you have an upcoming event, such as a wedding or high school reunion, you can make sure you look your best with quick and convenient in-office teeth whitening. The procedure can be completed in just over an hour, and produces similar results to the more leisurely at-home treatment. Give your smile a quick and effective touchup with your choice of professional teeth whitening options. To schedule an appointment, call Family First Dental in Overland Park, KS, today at 913-381-2600.